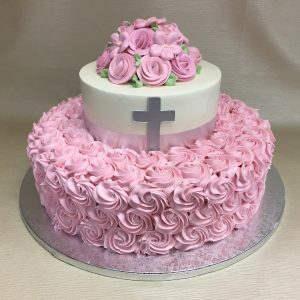 Design features full coverage same sized rosettes in customer’s choice of 1 color, with metallic rolled chocolate cross on front side. Shown in light pink buttercream frosting, with coordinating buttercream flowers in a top bouquet, & silver cross. Available in all flavors and sizes with 7 days notice.